Welcome to the first posting on my new blog...a savory nest. While I admit that I am an ardent fan of the internet and all that it provides with just a few simple keystrokes, I have to say that I limit my use of it to mostly email correspondence, perusing food blogs and websites, booking travel, and gathering research. Yes, there are the periodic, online shopping purchases, but no foray (yet) into the social networking realm (and none planned, as of right now). So why a food blog? Well...I love cooking...and writing...and creating. Not the labored, hours-in-the-kitchen type of cooking, but simple, delicious food that makes you glad you put the effort in. Food that not only tastes great, but looks great too. After all, presentation matters. I'm not a trained chef, just a lover of good things to eat and share. And...an admirer of good presentation. A beautifully plated meal, on a well-dressed and candlelit table is a lovely sight. That doesn't mean, by any stretch of the imagination, that every night is an event. I'd say I strive for a delicious meal most nights of the week, but I'm not opposed to takeout or a quickly tossed salad. It's all a matter of balance. And so, a savory nest is simply my creative outlet to share some of the many recipes we've enjoyed at our nest, ones that I feel are worth trying and even, perhaps, saving in your own files. I realize that the whole objective with this blog is to share recipes I've found to be quite delicious and yet, with the VERY first posting, the idea of what to include can be quite daunting. And so, I simply decided to post a great little side salad that we had last night, along with some very tasty, grilled chicken/basil/sun-dried tomato sausages and an interesting pear/arugula salad (a definite addition at a later date). With the summer crop of sweet, white corn readily available...and, oh so good...this salad is a real winner and one that can nicely accompany grilled chicken, sausages, salmon...you name it! It's slightly sweet (in a good way) but has a lovely bite with the addition of the lime, jalapeno, radish, and cilantro. 1. In a small bowl, whisk the first three ingredients. Gradually whisk oil into mixture, and season dressing with salt and pepper to taste. 2. Bring large pot of salted water to boil and add cleaned husks of corn to cook for approximately 8-10 minutes. To test doneness, carefully lift one of the husks from the water and prick several corn kernels with a fork. They'll just kind of "pop" when done to the right crispness (you don't want to over cook them). 3. Remove corn from cooking water and let cool. Once cooled, take each corn husk individually and hold it upright inside your serving bowl. Using a sharp knife, "shave" the kernels from the husk in a top-down motion. (If you have difficulty with this step due to a deep bowl, placing a small inverted bowl within your serving bowl will allow you to rest the husk a bit higher for cutting.) Once you've removed the kernels, just take a fork and break up any lengths of kernels that remain connected. 4. 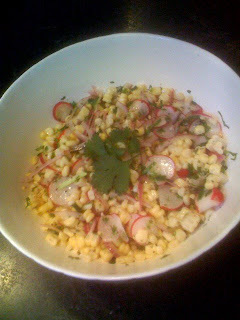 Toss corn kernels with radishes, cilantro, onion, jalapeno and dressing. Season with additional salt and pepper if needed. Transfer to plates and serve.